Japan makes many styles of green tea, and each type requires its own steeping parameters. It is easier to miss-step with Japanese green tea than it is with Chinese green tea because Japanese green teas are more sensitive to water temperature and length of time in the water. Sweetness/astringency in Japanese teas can be influenced by steeping technique. It is important to know what water temperature and steeping time is appropriate for each tea you have. The reason for this is that premium, spring-plucked Japanese green tea contains a large amount of amino acids and a lesser degree of tannin (which is primarily what makes a tea bitter). Steeping Japanese green tea in cooler water encourages the amino acids to release into the steeping liquid, but not the tannins. 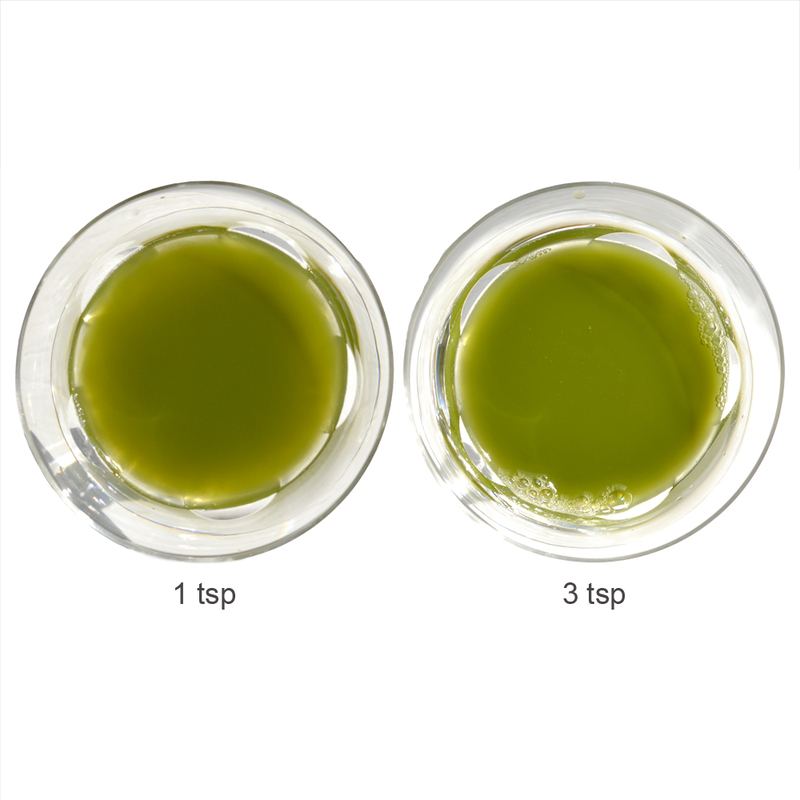 The above is an important factor when steeping or whisking both Matcha and Powdered Sencha, as well as leaf green tea. The powdered Sencha will not dissolve in the water, and it will be difficult to strain, even if you have a triple-fine Japanese strainer. It may need to be re-stirred if left to sit for a moment, as with the solids in a cup of cocoa. Please note the images of this preparation at the 1 scoop and 3 scoop concentrations as examples of the different opacities. Tea Trekker’s Powdered Sencha will not be able to be re-steeped because you will have consumed the finely-milled leaf particles in the first cup of tea. While it is unusual for a tea farmer to process his own tea, this is an accomplishment that the members of the Shizuoka Organic Tea Farmers Union are proud of. Jien-cha gives them total control over the finished tea, and also allows them to put all their years of knowledge about tea cultivation and manufacture into making truly delicious artisan tea. This delicious powdered tea is produced by our dear friends and expert tea masters at SOTFU. Traditionalists through and through, it is quite unusual for them to offer something new or contemporary. However, the next generation of these tea families is starting to shake things up a bit! This new powdered green tea is representative of the incoming fresh look that the next generation will have on Japanese tea manufacture. And why not!?! 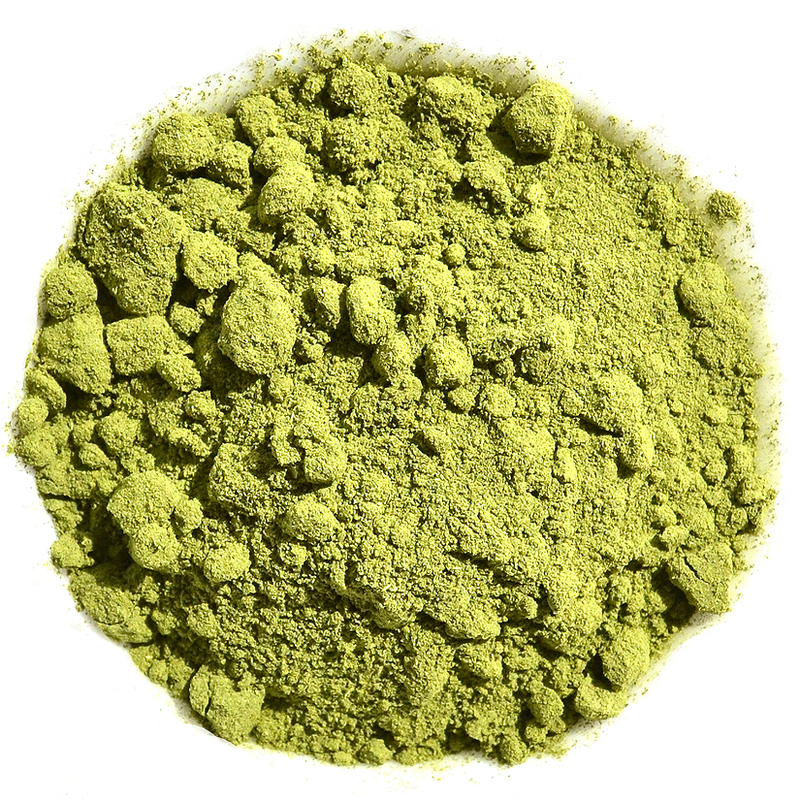 Tea Trekker’s Powdered Sencha is milled from a blend of 1st pluck spring tea leaves that would traditionally be blended into loose leaf Sencha. This leaf has a fresh, vegetal taste, vigorous flavor, pleasant, persistent astringency, and a deep green color. While not as particular a cultivar and not as demanding a manufacture as our genuine Matcha from Uji Prefecture, this powdered tea definitely has a ‘place at the table’ for those who need tea that has been been powdered to a fine milling. 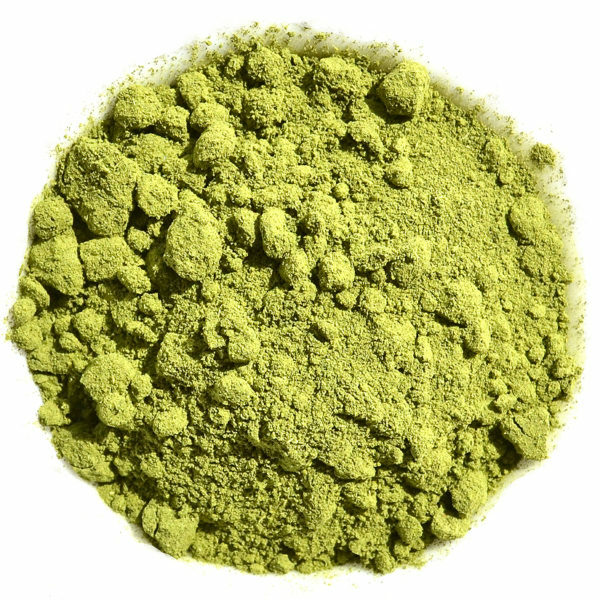 At half the price of Matcha, it is a legitimate option for those who wish to use powdered green tea for casual tea drinking or everyday use. It can also stand up to the addition of milk or other add-ins such as fruit, for instance when blending breakfast smoothies or lattes. This delicious powdered Sencha will also complement, flavor-wise, other ingredients in recipes that call for Matcha (or simply ‘powdered green tea’) such as cookies, cakes and ice cream.